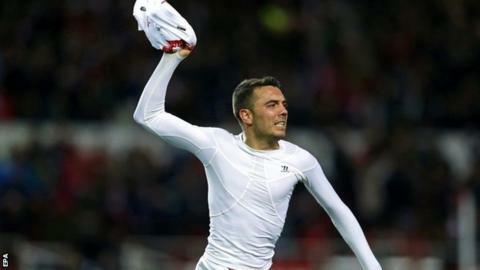 Iago Aspas scored a late winner as Sevilla beat Espanyol in an entertaining game to move up into the Champions League places. Cristian Stuani opened the scoring for the visitors with a 15th-minute penalty, but Diogo Figueras equalised with a stunning 40-yard effort before Vitolo tapped into an empty net. Espanyol keeper Kiko Casilla was sent off for handball but his side levelled after the break with Victor Sanchez curling home from 18 yards. But Aspas, on loan from Liverpool, slotted home in the 89th minute after being found in space 16 yards from goal. Espanyol may feel aggrieved with the result, as Sevilla goalkeeper Beto was lucky not to be sent off when he fouled Salva Sevilla for the converted penalty. However they can have no complaints about their keeper's 40th-minute red card which came when he blocked an Aspas chip with his hands outside the box. Match ends, FC Sevilla 3, Espanyol 2. Second Half ends, FC Sevilla 3, Espanyol 2. Foul by Daniel Carriço (FC Sevilla). José Cañas (Espanyol) wins a free kick in the defensive half. Attempt missed. Vicente Iborra (FC Sevilla) right footed shot from the centre of the box is too high. Assisted by Iago Aspas. Attempt missed. Fuentes (Espanyol) header from the left side of the six yard box is high and wide to the left. Assisted by Abraham with a cross following a set piece situation. Iago Aspas (FC Sevilla) is shown the yellow card for excessive celebration. Goal! FC Sevilla 3, Espanyol 2. Iago Aspas (FC Sevilla) left footed shot from the centre of the box to the bottom right corner. Assisted by Carlos Bacca. Attempt blocked. Denis Suárez (FC Sevilla) right footed shot from the left side of the box is blocked. Assisted by Carlos Bacca. Attempt missed. Fernando Navarro (FC Sevilla) left footed shot from outside the box is just a bit too high. Carlos Bacca (FC Sevilla) is shown the yellow card for a bad foul. Substitution, FC Sevilla. Carlos Bacca replaces Éver Banega. Substitution, FC Sevilla. Denis Suárez replaces Vitolo. Goal! FC Sevilla 2, Espanyol 2. Víctor Sánchez (Espanyol) right footed shot from outside the box to the top right corner following a fast break. Corner, FC Sevilla. Conceded by Javi López. Attempt missed. Diogo Figueiras (FC Sevilla) left footed shot from outside the box misses to the left. Attempt missed. Fernando Navarro (FC Sevilla) header from the centre of the box misses to the left. Assisted by Éver Banega with a cross following a corner. Corner, FC Sevilla. Conceded by Diego Colotto. Corner, FC Sevilla. Conceded by Pau. Attempt missed. Iago Aspas (FC Sevilla) header from the centre of the box is close, but misses to the left. Assisted by Éver Banega with a cross following a set piece situation. Aleix Vidal (FC Sevilla) wins a free kick on the right wing. Éver Banega (FC Sevilla) is shown the yellow card for a bad foul. Foul by Éver Banega (FC Sevilla). Iago Aspas (FC Sevilla) hits the left post with a left footed shot from the left side of the six yard box. Assisted by Aleix Vidal with a cross. Vicente Iborra (FC Sevilla) hits the right post with a right footed shot from the centre of the box. Assisted by Iago Aspas. Foul by Timothée Kolodziejczak (FC Sevilla).